Concrete Floor Polishing in Northern Va, DC, and Maryland. Revive your concrete floor today with a professional polish from Stone Patios VA which provides Northern VA Patios & Construction. 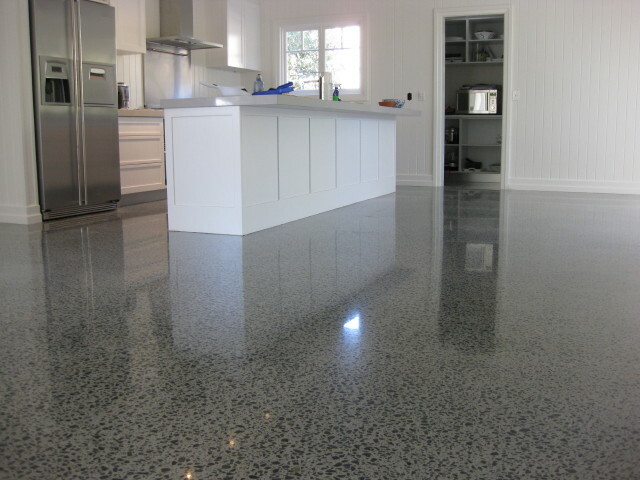 Control the level of the glossy appearance with our polishing levels during your concrete floor polishing. We meet with you and discuss your needs and goals from having your floors polished and apply accordingly. You can take your appointment with us at Northern VA Patios & Construction a step further by changing the design of your concrete flooring. You can choose a polish with a new color, our skilled professionals can change the texture, create a new pattern with our tools, and we can even add objects into the concrete before polished if desired. After your polish is finished, the maintenance for your floors should be decreased by 50-75%. You should also save money and time because your newly polished and sealed flooring just simply needs dusting and wet mopping without cleaners. Cleaners will rarely be necessary and should only be used occasionally. We are proud to say that we have been serving the Fairfax County, Great Falls, Loudoun County, and Ashburn for over 25 years. We value each and every client and their time. We appreciate your trust in Northern VA Patios & Construction for all of your polishing, resurfacing, and hardscaping needs. Feel free to call us at (703) 349-4433 Stone Patio VA & Construction for any questions you may have and book a consultation today.